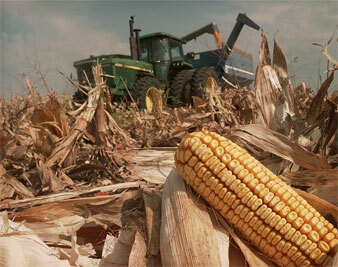 Biofuels have become the new villain in the climate change and food crisis debate. But America's consumption of meat is a bigger part of the problem than the cars and trucks we drive. Frances Cerra Whittelsey drives a 2002 diesel VW Jetta that gets 40 mpg. She loves bacon, but is working to reduce her own consumption of meat. 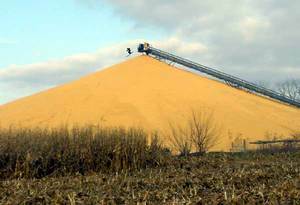 Only three years ago there was such a surplus of corn in the Midwest that it became a joke. Someone pasted the image of a skier into a photo of a mountainous pile of the stuff, labeled it “ Ski Iowa,” and e-mailed it around the Internet to hand everyone a laugh–except the farmers, of course. At the time, turning all that unwanted corn into ethanol to replace gasoline seemed like a great idea. But that was then. Today, corn ethanol has become the bad-boy alternative to petroleum, criticized for driving up food prices, destroying rain forests and worsening climate change. For good measure, the criticism is usually leveled at biofuels in general, even though the other category of biofuel–biodiesel–is not made from corn and has a much more beneficial climate-improving profile. For some environmentalists, the only acceptable green energy options are wind, solar and geothermal power. Former Vice President Al Gore recently challenged America to end our reliance on carbon-based fuels in ten years by shifting electricity production to those three ideal options. Along the way, he suggested assisting auto makers to build plug-in cars and phase out gasoline and diesel-powered vehicles. However, even if this utopia can be achieved in a decade–and I fervently hope that it can–Americans are stuck with cars they wish they could plug in but can’t. America and the world will need liquid fuels for a long time to come, and biofuels, including some corn ethanol made at the most efficient distilleries, offer a far better option than continued use of fossil fuels. Biofuel critics, including the Grocery Manufacturers of America, often frame the problem as a choice between feeding people and feeding SUVs; they blame rising food prices on diverting food crops to fuel production. The trade group has mounted a public relations campaign to try to roll back high Congressional mandates for increasing use of ethanol. While concern about rising food prices is certainly justified, for grocery manufacturers the argument is also self-serving. Food manufacturers make their profits not on raw vegetables or commodities like cooking oil but on processed foods, and they want to direct public anger about food price inflation away from themselves. Packaging, processing, advertising, transportation and profits account for most of the price of processed foods, and the surging price of oil figures heavily in that mix. The cost of corn, even as the major ingredient in a food like corn flakes, accounts for a tiny fraction of the final price. But it’s false to frame the biofuel debate as a choice between people or SUVs. While there are daily references in the media to the diversion of corn to fuel-making, there’s hardly ever a mention of the fact that feeding our livestock uses 50 percent to 60 percent of the American corn crop. Here are the calculations used by the US Agriculture Department’s Economic Research Service for how much corn animals must be fed to produce a pound of meat for retail sale: seven pounds of corn equals one pound of beef; six-and-a-half pounds of corn equals one pound of pork; two and six-tenths pounds of corn equals one pound of chicken. (Meat industry estimates are lower but generally refer to the amount of corn necessary to make the live animal gain a pound, not the amount necessary to get a pound of food in the meat case.) Corn is a dietary staple in parts of the world like Mexico, but not here in the United States, where the answer to “What’s for dinner?” is supposed to be “beef.” Talk about feeding SUVs or people is deceptive, since it masks the intermediate step of feeding animals a whole lot of corn to get one steak dinner. Even more hidden from public view is the role of animal feeding in global warming. The shocking fact is that production of beef, pork and poultry is a bigger part of the climate problem than the cars and trucks we drive, indeed of the whole transportation sector. In our fantasies–and ads–we see contented cows eating grass, but the fact is all but a lucky few spend much of their lives in dismal feedlots where grass does not grow, getting fat on corn and other unspeakable byproducts. Internationally, two-thirds of the earth’s available agricultural land is used to raise animals and their feed crops, primarily corn and soybeans, and the trend is accelerating as people in Latin America and Asia increasingly demand an Americanized diet rich in meat. The need to grow more animal feed and more animals has been devastating rainforests and areas like Brazil’s Cerrado region, the world’s most biologically diverse savannah, long before the demand for biofuels began escalating. Vegetarians have long understood this issue, but asking the American public to eat less meat is still a radical idea, politically untouchable. Yet the meat industry is a giant source of greenhouse gases, of which carbon dioxide is only one, and not the most dangerous one. All those steer feedlots and factory buildings crammed with pigs and chickens produce immense amounts of animal wastes that give off methane. On an equivalent basis to carbon dioxide, methane is twenty-three times more potent as a greenhouse gas. When you add in the production of fertilizer and other aspects of animal farming (including land use changes, feed transport, etc.) livestock farming is responsible for nearly one-fifth of human-induced greenhouse gas emissions, more than the transportation sector, according to a 2006 report by the Food and Agriculture Organization of the United Nations. None of which excuses knocking down trees in a rain forest to grow fuel crops or burning dirty coal to make a supposedly cleaner, biofuel substitute. People around the world for whom corn and other grains are a food staple–not an ingredient or animal feed–need help to avoid starvation, regardless of the reason, be it biofuel production, drought, flood or war. Someone like Al Gore needs to have the courage to stand up and exhort Americans to eat less meat so that others do not go hungry. But here’s the point about biofuels that critics overlook: today’s biofuels are a transitional form of liquid fuel, and by setting standards for a new generation of biofuels, we can reap their benefits without harmful environmental side effects. Backers of corn ethanol do their best to point out its positives: it is replacing imported petroleum and its use in gasoline as an oxygenator does make gasoline less polluting. (MTBE, the chemical it replaced, had to be phased out because it seeks out and pollutes underground water supplies.) But after much expert analysis of the life cycle benefits and drawbacks, it’s clear that corn ethanol, especially when made with energy from coal, has a negative impact on the environment. However, change is on the way. Visible in a story here and there is the reality that we are in the midst of an explosion of entrepreneurial effort and progress toward commercialization of an improved generation of biofuels. An array of new companies are using and commercializing biofuel production from waste products or non-food vegetation like switchgass. Thanks to the inconsistent policies and pro-oil bias of Congress and various presidents, we are years behind where we should be in this development, but progress now seems irreversible. For example, Range Fuels of Broomfield, Colorado, plans to make ethanol from slash, the bark and branches left over from the harvesting of pines grown on plantations. Range recently raised $100 million to complete a facility next year in Soperton, Georgia, that it says will be able to make 20 million gallons of ethanol a year from slash. An even better fuel source may turn out to be green algae, the stuff that grows in virtually any pool of stagnant water (it need not be of drinking quality) and that is exposed to sunlight. Fortunately, algae feed on carbon dioxide and grow very fast. The possibilities are tantalizing. For example, Greenfuels Technology of Cambridge, Massachussetts, is currently scaling up an algae farm at a power plant in Arizona. The carbon dioxide emitted by the power plant is fed to the algae, which are then harvested to make either ethanol or biodiesel. If this process is successful on a large scale, it opens up the possibility of recycling power-plant CO2 emissions to create abundant liquid fuel to replace petroleum. That would be a Holy Grail indeed. It is not an exaggeration to say that entrepreneurs are in a race to successfully commercialize the next generation of biofuels. Backing for these efforts is coming from venture capitalists and companies like Waste Management, the behemoth of the garbage industry; the Royal Dutch Shell Group; E.I. Dupont De Nemours; Goldman Sachs; and Khosla Ventures, a venture capital firm run by Vinod Khosla, a founder of Sun Microsystems. If the maxim of following the money is any guide, then the road to viable, sustainable biofuels is under construction. The market forces already in play can be shoved in the right direction–and, of course, the wrong one–with government mandates and standards. Minnesota, for example, has mandated for several years now that all diesel fuel sold there must contain 2 percent biodiesel, and is raising the requirement to 5 percent. The reason is that gallon for gallon, soybean biodiesel lowers CO2 emissions by 78 percent, compared to petroleum diesel, according to the latest estimate, and dramatically lowers emissions of the tiny particulates implicated in asthma. But America’s biodiesel industry is currently in a faint, operating at only about 20 percent capacity, and exporting to Europe much of what it is making. A major reason for this is that the infrastructure to blend biodiesel into petroleum diesel is lacking. Nationally, trucks that supply retail outlets with gasoline and diesel pick it up at 1,500 terminals. Only forty-two of them, less than 3 percent, are equipped to handle biodiesel, with many of those located in or near Minnesota. So even though the industry has the capacity to send 2.21 billion gallons of biodiesel to market, according to the best estimate of the National Biodiesel Board, a trade group, we are, instead, still burning 80 percent of that amount in the form of polluting petroleum diesel. This is particularly harmful in inner cities, where pollution from diesel buses and trucks is concentrated. But without assured demand for biodiesel, terminal operators are unwilling to invest the $1.5 million necessary to construct necessary special facilities at each terminal. Biodiesel proponents expect the industry to recover next year when new federal requirements for use of alternative fuels go into effect, including a specific requirement for use of 500 million gallons of biodiesel. But here is where the fight is taking place over ethanol. While the Energy Independence and Security Act of 2007 mandates steadily increasing use of both biodiesel and next generation ethanol it also guarantees the continued existence of the corn ethanol industry. In fact, it ratchets up the required use of corn ethanol from 10.5 billion gallons in 2009 to 15 billion by 2015. As is the way inside the Beltway, the legislation thus satisfied the political needs of members of Congress from corn-growing states. Given the unintended consequences of pushing up corn ethanol production so rapidly, Congress needs to revisit those targets and to do it quickly, in fairness to farmers who need time and consistent policy to manage their farms effectively. Sophisticated studies published early this year show clearly that whether biofuels reduce carbon dioxide emissions depends on where and how they are produced. However, there may be a better approach that gets politicians out of the business of micromanaging production of food crops. Some environmental scientists, like the late Alex Farrell of the University of California at Berkeley, have advised against setting specific targets by fuel type. Instead, they favor an approach that has been adopted in California. In January, 2007, Governor Arnold Schwartzenegger signed an executive order mandating that by 2020 the carbon content of any and all passenger vehicle fuel sold in the state–including petroleum–be reduced from current levels by 10 percent, a preliminary goal. How fuel suppliers make that cut will be up to them. They can get there by mixing a cleaner fuel into gasoline, for example, or by buying and trading carbon credits. Because Californians use about 11 percent of all the gasoline consumed in the United States, the order is expected to have substantial impact. More comprehensive standards on an international level are also in the works. A draft of an international rating system for biofuels may be ready early in 2009. It could result in a labeling system that takes into account the impact of fuels not only on the environment but also on social justice concerns including food security and workers’ rights. “Many people are worried about biofuels contributing to deforestation and air pollution in the name of protecting the planet,” said Claude Martin, member of the board of the International Institute for Sustainable Development and chair of the steering committee of the Roundtable on Sustainable Biofuels. The roundtable, whose headquarters are at the University of Lausanne, Switzerland, has been holding a series of meetings that include manufacturers, conservation leaders, government and UN representatives and non-governmental organizations. “The roundtable will bring together all these actors…to ensure that biofuels deliver on their promise of sustainability,” he said. That is unquestionably a tall order. But so is every aspect of the revolution necessary to end the era of fossil fuels. Biofuel production is not the silver bullet for global warming, but it can be part of the solution. Generating electric power entirely from solar, wind and geothermal by the end of 2018, as Al Gore has boldly proposed, would be another big piece. But there’s also a need to break the silence around the role of American eating habits in global warming and global hunger. Reducing our addiction to meat may not be popular, but we need to view our love affair with burgers and barbecue in the same frame as gas-guzzling SUVs. Frances Cerra WhittelseyFrances Cerra Whittelsey blogs at The Equalizer. An author and former consumer reporter for the New York Times, she teaches journalism at Hofstra University.